One of the great things about prairies – and nature in general – is that there is way more to discover than I’ll ever have time for. Especially within the world of invertebrates, there is no shortage of species to learn about, and every one of them has a fascinating story. During the last two weeks, I’ve started paying attention to longhorned flower beetles, a group of species I’d noticed before while looking for bees. Not surprisingly, once I started really looking at them, I discovered that there are multiple species and that they are much more common than I’d realized. This longhorned beetle is likely Typocerus confluens, according to Ted MacRae, but he said there are others that look enough like it he can’t tell for sure from a photograph. The Nature Conservancy’s Platte River Prairies, Nebraska. These beetles belong to the “flower longhorn” group of insects (family Cerambycidae, subfamily Lepturinae). Adult flower longhorns are largely diurnal (active during the day) and feed upon a wide variety of wildflowers. When I started looking for information on longhorns, I turned to Ted MacRae, an entomologist and author of the fantastic blog, “Beetles in the Bush“. Ted thought this was probably Typocerus octonotatus, a common Great Plains species of longhorned beetles. You might think it looks just like the T. confluens in the earlier photo, but look more closely at the color pattern… I know, right?! Helzer Family Prairie, near Stockham, Nebraska. 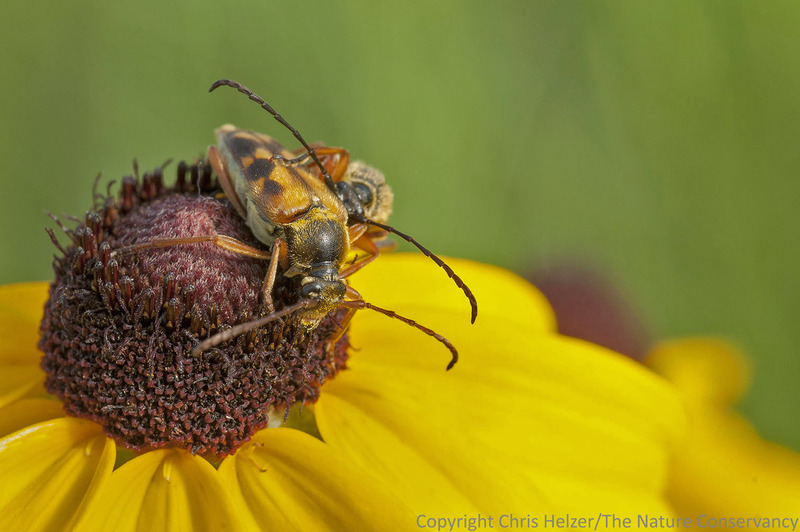 Flower longhorn beetles are named for their habit of feeding on wildflowers as adults. 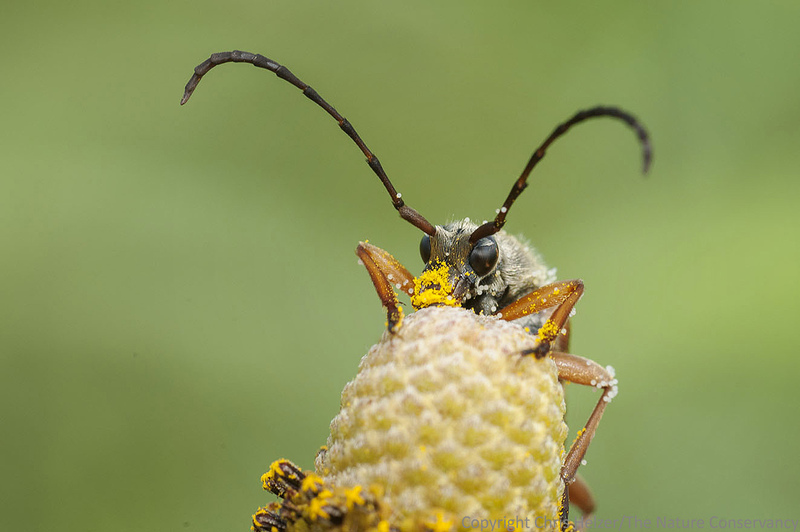 As larvae, on the other hand, most longhorn beetles are wood-borers. That includes many (most?) members of the Typocerus genus – the genus of beetles I’ve been seeing. However, Ted says the larvae of many Typocerus species in the Great Plains are actually subterranean root feeders on prairie grasses. That, of course, seems a much more sensible strategy for insects in landscapes with only widely scattered woodland habitats. A longhorned beetle with a face full of pollen. Now that I’ve started to pay attention to longhorned flower beetles, I’ll probably never ignore them again. That’s both a blessing and a curse. I love learning about new species, but it makes prairie hikes go more slowly because the more species I recognize, the more there is to see. If this keeps up, it’ll take me all day to walk 100 yards! 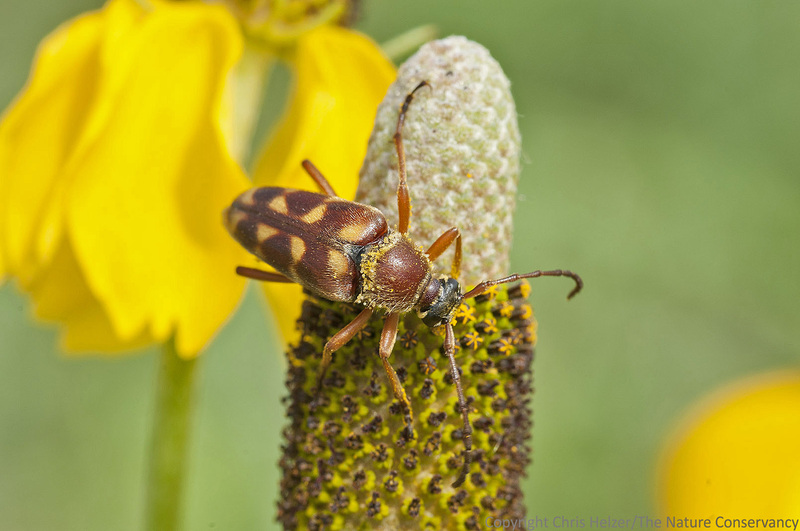 This entry was posted in Prairie Insects, Prairie Natural History, Prairie Photography and tagged beetle, flower, flower beetle, flower longhorn, grassland, great plains, lepturinae, longhorn beetle, nebraska, prairie, ted macrae, wildflower by Chris Helzer. Bookmark the permalink. Thanks for the infection! Those pix are superb, as usual. What a treat to see weird creatures up close! Thanks, Chris! Your posts always open my eyes to new experiences right under my nose. I’ve taken to going out in the prairie and just standing or kneeling for long periods of time to take in all the scenery and activity going on around me. Fascinating! Excellent post (of course!). Regarding photo technique (the last one is especially nice), did you use low f-stop w/ natural light to get such nice backgrounds? I’ve never been happy with my foliage backgrounds for flower-feeding insects and have (mostly) resorted to sky, but then I’m using full-flash and rather high f-stops. Thanks very much, Ted. The photos in the post were all taken in natural light (bright overcast days, which are the kind of days on which I grab my camera and go look for close-up photo ops) with a shutterspeed of 1/80 sec and aperture of either 18 or 20 (ISO 320). I was close enough that even with a fairly high aperture, much of the background was fuzzed out, but I was also working in prairies with some light grazing, which reduced the amount of vegetation behind the flowers. I am not above gently bending vegetation out of the way in the background of my photos either – to make a cleaner, less distracting background – though that’s more difficult when photographing wary insects. In this case, the longhorns wouldn’t have cared if I’d driven back and forth over the background vegetation with an army tank, but thankfully, I didn’t have to resort to that. After a number of years spent exploring nature I’ve begun to realize and a fast walk in the woods is an opportunity missed. I’m always glad to learn more interesting stuff. The infection is welcomed. I assume you’ve seen this fellow. And, can you make them squeak? I have definitely seen them. In fact, I just photographed one the other night! You can make them squeak? Yes. Pick one up by the sides between thumb and index finger. Hold it to your ear. It should squeak. I think it’d be a great project! And I agree with you – I think it would open many eyes.